Professional Boxing World Champion Christina Hammer arrived from Germany to New York to learn basics of Russian and Kazakhstan boxing technique from Russian trainer Michael “Coach Mike’ Kozlowski. Professional Boxing World Champion Christina Hammer arrived from Germany to New York to learn basics of Russian and Kazakhstan boxing technique from Russian trainer Michael “Coach Mike” Kozlowski. Boxing World Champion, Christina Hammer, in office of Michael "Coach Mike" Kozlowski. Michael Kozlowski – first trainer of the past-Soviet times who brought and successfully uses bases of the Russian School of Boxing, in the USA. Because of the technique and foot work of “Coach Mike” (that’s how Russian boxing trainer, Michael Kozlowski, called by Americans), his student, Yury Foreman, without fighting spirit, without punch, without chin, in which any boxing expert in USA did not see the future on professional ring, became one of leading prospects in amateur boxing of USA, and then became World champion among professionals! American student of the Russian trainer, Jill Emeri, in whom, as well, as in Michael Kozlowski’s student, Yury Foerman’s, any trainer of well-known New York boxing Gleason’s Gym, did not see the future in professional boxing, and because of the technique of Russian trainer, she was one of the best boxers in female amateur boxing in USA in the late 90′ and first half of 2000th. In 2004 by Federation of USA amateur Boxing, Jill Emeri received title Boxer of Year. In 2008, Jill Emeri became Boxing World Champion among professionals. In 2015 tree times of “Golden Gloves” champion, in three different weight classes, Jill Emeri, has been included in “Hall of Fame” of one of the most prestigious tournaments in amateur boxing of the USA! Other prospects of boxing trainer, Michael Kozlowski, Luke Campbell, from England, thanks to essential additions of techniques and foot work of Russian trainer, became the Champion of Olympic Games 2012, in London. The Ukrainian boxer-heavyweight, Egor Plevako, in whom Ukrainian federation of boxing has given up, after two years of work on development of techniques with Michael Kozlowski in USA, became first number of Boxing Team of Ukraine and has won the European championship 2012 ! For Christina Hammer Russian boxing style of Gennady Golovkin and Sergey Kovalev always was an example for imitation. But in Germany was no trainer who could teach her this style. Therefore the Champion has used the first possibility to try to study this Americanized Russian boxing style, based on ideal foot work, of the trainer who has brought and kept bases of the Russian boxing school in the USA. 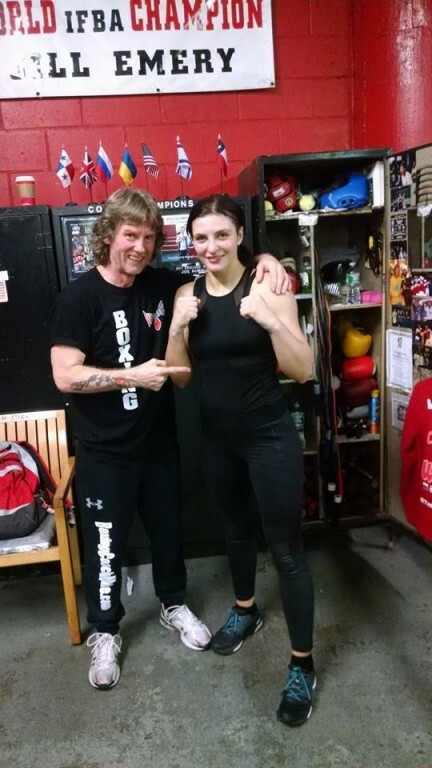 Boxing World champion, Christina Hammer, learns technics of the Russian trainer, Michael Kozlowski, in New York. Michael Kozlowski has been very surprised and, at the same time, is pleased by when on the first training saw that his new student, despite the reached successes on a professional ring, completely does not have elementary skills of boxing techniques!